2014 Volkswagen Tiguan Pros and Cons: Why (Not) This Car? In its bid to become the world's largest auto maker, Volkswagen aims to sell far more cars in the United States. One problem: Americans are hot for crossovers, and VW doesn't yet have any designed for American tastes. And by American tastes, I mean American budgets. The Tiguan and Touareg both cost considerably more than the major players in their segments, so they better offer something the others don't. In recent decades, VW's ads have pitched German engineering at a (relatively) affordable price and driving enjoyment. Combine them and you get a neologism: Fahrvergnugen. A new-for-2014 R-Line version of the Tiguan is VW's most serious stab to date at a fun-to-drive compact crossover. But the Tiguan no longer has this space to itself. Ford's latest Escape was primarily engineered in Germany (where it's sold as the Kuga) and also can be purchased with a turbochaged four-cylinder engine. Are the R-Line enhancements enough to keep the Tiguan from getting beaten at its own game--and to justify a nearly $40,000 sticker price? Beige isn't the sportiest color. Why the 2014 Volkswagen Tiguan? When the Tiguan was introduced as a 2009 model, its interior materials weren't the best. But a mid-cycle enhancement included some upgraded bits--including a downright squishy top for the instrument panel--and the 2014 has the highest quality, most solid interior in the segment. Going down the road, the Tiguan has the rock-solid feel people expect from a German-engineered car. Inside the Ford, most of the materials are of sufficiently high quality that bits like the flexy door pulls stand out as exceptions. With some bits better and others worse than in the VW, I'll call this one a draw. I last reviewed the Tiguan in mid-level trim. Compared to the athletic Mazda CX-5 we had the same week, the Tiguan SE's steering felt light and its suspension felt flaccid. While my wife preferred that VW's "easy driving" character, she's not a driving enthusiast. The Tiguan R-Line, with (if memory serves) weightier steering and a dramatically firmer suspension, tackles curves with more enthusiasm and less roll. The well-shaped steering wheel still doesn't deliver much feedback, but the tight, thoroughly predictable chassis inspires confidence. Understeer keeps things safe when the tires' limits are approached, but doesn't intrude otherwise. Especially when fitted with the turbocharged 2.0-liter four, the Escape feels heavier and plows more in hard turns--unless you get on the gas to even things out. It also rolls a little more than the Tiguan before taking a set. The Ford's broader range of behavior can make it more fun to drive, especially on moderately challenging roads. But the VW's more buttoned-down chassis makes it technically the better-handling vehicle. As we'll see, though, this win comes at a price. Truncated tail works with large wheels. Controls easy to reach and operate. With the partial exception of the Passat-based, Mercedes CLS-imitating CC, VW doesn't do swoopy. The Tiguan's styling was clearly dictating by function. Compared to the Escape's windows, the VW's are larger and more upright. Also, the Tiguan's instrument panel, while fairly tall, isn't nearly as deep. Consequently, outward visibility is about as good as it gets in a segment where outward visibility has been a primary draw. Based on the specs, the Tiguan suffers from insufficient dimensions. It's 3.6 inches less lengthy than the Escape, and as a result has an inch less legroom. And the Ford falls near the bottom of the segment in this spec. In the real world, though, the Tiguan's rear seat feels roomier and more comfortable than the Escape's and in the ballpark with the class leaders. A relatively large seat bottom is high enough off the floor to provide adults with thigh support. The rear seat back is more comfortably shaped than the compact crossover norm, and reclines. One nit: hard plastic isn't the most comfortable surface for a rear armrest. 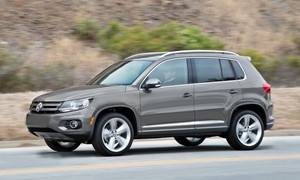 Why Not the 2014 Volkswagen Tiguan? Equip a 2014 Escape Titanium with the 2.0T engine, all-wheel-drive, 19-inch wheels, nav, and panoramic sunroof to go head-to-head with the Tiguan R-Line, and the tally rises to $35,825. Not cheap. But the Tiguan R-Line, with a $39,355 sticker, will set you back another $3,530. This lofty price is easily the #1 reason you won't be seeing many top-of-the-line Tiguan's on the road. A couple thousand more can get you a less functional but more fun BMW X1. Unless you insist on fitting the BMW with similarly large wheels. Then it costs $6,045 more before adjusting for feature differences, and about $3,800 more afterwards. Still a bit close for comfort. Venture lower in the range, and the Tiguan's price is much more competitive. A Tiguan S lists for $1,550 less than an Escape SE 2.0T. Though nearly all of the difference can be explained away by the Ford's additional features, rough parity is far better than a $3,500 disadvantage. Basically, the more heavily you equip the two vehicles the better the Ford looks and the worse the VW looks. Perhaps this should come as no surprise. Charging above market prices for features is the German way. Now we come to the downside of the Tiguan R-Line's sport suspension: it rides VERY firmly. Perhaps not quite harshly, but the tires pound over even minor bumps. Even with its optional 19-inch wheels the Escape has a much more compliant ride. It's fairly quiet inside the Tiguan, but quieter still inside the Escape, which has a more premium feel to it. To be current you must have LEDs. There's more room and comfort here than the specs suggest. The Tiguan's cargo volume specs place it with the Hyundai Tucson and Kia Sportage near the bottom of the segment. Maximum cargo volume is 56 cubic feet, compared to 68 for the Escape and 73 for the Toyota RAV4. While VW likely made conservative assumptions with these specs as well, in this case they more closely track reality. The Tiguan's shorter length is largely due to a truncated tail, and truncated tails aren't the best for hauling stuff. Still, unless you have a lot of stuff to haul, or one very long or very large object, there's plenty of space here. Lower trim levels do better with long objects, as they have a folding front passenger seat. The R-Line's power passenger seat precludes this feature. The tested vehicle had "CarGo Blocks," a $235 accessory. These attach to a heavy-duty cargo mat using velcro, so they can be repositioned to hold items in place. The 400-watt Fender audio system acquits itself well, especially if you like a pinch of reverb added to your tunes. The nav, not so much. It'll do if you just want to enter an address and then get shown where to turn. But if you want to use the system like a map (guilty), you'll be frustrated. You can't zoom out far, and street names quickly disappear when you do. Is this the tradeoff for having the system standad on the top two trim levels? Perhaps. But how hard is it to permit the system to zoom out, and not drop the street names? Even with a list price near $40,000, the Tiguan lacks a number of features increasingly common in the segment. You can't get a power liftgate, adaptive cruise control, or any safety aids beyond a rearview monitor. But the R-Line does have dual 12-way power seats and a panoramic sunroof. If you like the clean, understated styling of other Volkswagens, you'll probably like that of the Tiguan. With a long nose and short tail, the crossover's proportions are odd, sporty, or both. I've never been a fan of the overall look before, but the R-Line's five-spoke 19-inch wheels just about made me one. They're a big improvement over all the wheels that have been offered before. Both front seats have 12-way power adjustments, but their headrests just a bit too far forward and they provide little in the way of lateral support. The Tiguan R-Line needs a seat upgrade to match its suspension upgrade. The Escape's front seats are more comfortable and provide more lateral support in hard turns. The Tiguan's controls are close at hand and easy to understand and operate. It helps that VW hasn't yet attempted a leading edge infotainment interface like the Escape's MyFord Touch. On paper, the Tiguan R-Line (with the same engine as all other North American Tiguans) is down 40 horsepower compared to the Ford Escape, 200 vs. 240. In the real world, the difference in performance is not so large, with the Tiguan taking perhaps another third of a second to get from zero to 60 mph. The Tiguan compensates for slightly less quick acceleration with a more responsive six-speed automatic transmission. (The Ford's box is its weakest link.) A DSG dual clutch automated manual transmission like that offered in the GTI would be more responsive still, but isn't offered here in the Tiguan. In the lowest trim levels, with a price in the mid-20s, the Tiguan's straight-line performance stands out. You can't get an engine nearly this strong in a Honda, Mazda, ot Toyota. But venture up near $40k and there are quite a few quick options. The 256-horsepower engine recently offered in the Golf R, also a turbocharged 2.0-liter, would better justify the R-Line's price. The Tiguan's EPA ratings of 20 mpg city, 26 mpg highway place it near the bottom of the segment. The Escape with the 2.0T engine and all-wheel-drive does a bit better, 21/28. Neither can match the BMW's 22/33. But the BMW cheats by being barely tall enough to be considered a crossover at all--it's more a tall station wagon. The Tiguan and Escape are about five inches taller. In the real-world, the VW's trip computer reported higher numbers than the Ford's. In the suburbs I regularly observed averages in the mid-20s (vs. low 20s in the Ford). On a 70-mph highway I observed 25. In general crossovers struggle to match their EPA highway ratings at 70 mph, as the EPA test averages 48 mph. As speed increases, fuel economy suffers more in crossovers due to their height. The Tiguan offers clean styling, quick acceleration, and confidence-inspiring handling in a package that's more functional than its subpar specs suggest. If you're looking for the tightest suspension in sub-premium crossover, you've found it. But you've also found the stiffest ride and the highest price, with the latter the obvious explanation for the Tiguan's low sales volume. Pricing is more competitive lower in the Tiguan range, but you only get the sport suspension at the top.The Tiguan R-Line is arguably a better vehicle than the Ford Escape, especially if outward visibility and easy to operate controls are priorities. But not a $3,500 better one. VW's ubiquitous 2.0T engine feels stronger than its official 200-horse spec. Among the tightest in the segment, but your stuff will most likely fit. Volkswagen and Ford each provided insured vehicles with a week with a tank of fuel. 2014 Volkswagen Tiguan pros and cons, according to Michael Karesh: the best reasons for buying (or not buying) the 2014 Volkswagen Tiguan. Join TrueDelta to post your own impressions. I know many if not most reviewers fault the rear cargo area of the Tiguan but in the real world it handles the things that I most often load. I don't try to put a large square box like a washing maching or a stove into a SUV. Even if it fit I couldn't carry it upstairs. That's why there are delivery services and installers. I found the Tiguan to be the only mid/small SUV to carry 8 ft pieces of lumber back from Home Depot with the rear hatch closed. The Tiguan's front passenger seat (Not R-Line) folds flat and yields up 96 inches of room for a stack of 8 ft lumber. With other "larger" SUV's you have to lay the lumber over the top of the passenger seat or over the center console - your choice on whether you want to get whacked on the head when you make a sudden stop or find you can't shift into reverse with the lumber sitting on top of the shifter. BTW this feature should also accomodate bikes without removing front wheels and shorter surfboards. Also, for some perverse reason most manufacturers think only the driver needs multi-way seat adjustments. Don't they realize that the real decision-maker is sitting in the front passenger seat. Even the lower range Tiguans offer 8-way seat adjustments (mostly manual) with fore-aft, seat height, seatback rake and lumbar adjustments for both driver and passenger! The r-line adds seat bottom tilt - all electric. Finally some straight talk about oft-cited fuel economy figures. Many reviewers simply accept the manufacturer's claims. Even the EPA does in most cases. Audits are far and few between. However, as a recent $100 million dollar fine of Kia/Hyundai has shown, manufacturers do lie about their gas consumption in order to entice gullible buyers. VW has introduced their 3rd generation of the EA888 2 liter turbo engine which has improved mileage considerably but they left the EPA numbers pretty much unchanged so I find myself getting considerably better mileage figures for city and hwy (both onboard computer reported mileage as well as gas pump calculated mileage). Before buying the Tiguan I was leaning to the Subaru Forester XT which I still think is an exceptional car but I did notice that many consumer reviews mentioned that they weren't getting the EPA numbers. Go figure!! I'm also a big fan of folding front passenger seats. And my experience agreed with yours--the Tiguan easily beats its EPA estimates. I have a 2013 VW Tiguan SE (FWD). Love the overall compromise between utility & sportiness. For me (live in San Diego) - it is the best of both worlds. Fuel economy: I replaced the paper airfilter element w/ a K&N filter in the factory box. My overall average (80% city driving)is about 24 mpg. However on longer interstate road trips at ~70-75 mph, I get an honest 28 - 29 mpg! Cannot complain.